The Woodside Innovation Centre at Monash University brings together the University’s pioneering research and design capabilities with one of Australia’s leading oil and gas companies. The partnership aims to drive significant advances in the energy sector and incorporates cutting-edge technology with exceptional expertise in both engineering research and design, and IT. It will establish a globally connected innovation hub that rapidly accelerates advances in materials engineering, additive manufacturing and data science. The centre demonstrates Monash University’s commitment to connecting our world-leading research with industry. Woodside’s FutureLabs are building an ecosystem of scientific and technological innovation through collaborations with research institutions, start-ups, entrepreneurs and adjacent leading industries. 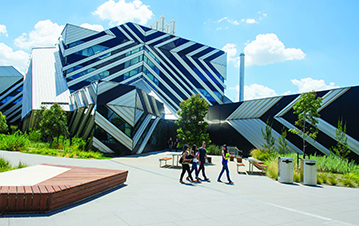 The aim is to rapidly advance commercial opportunities through materials engineering, additive manufacturing and data science, areas where Monash has leading research expertise.